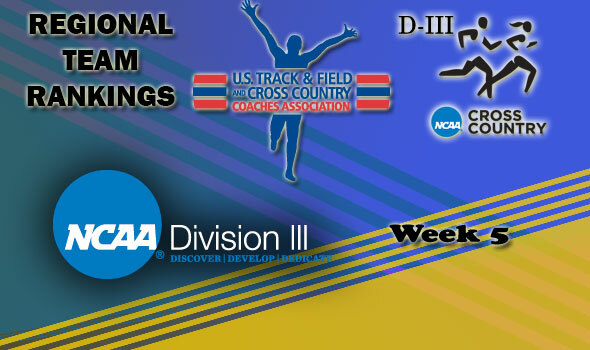 NEW ORLEANS – The U.S. Track & Field and Cross Country Coaches Association (USTFCCCA) released week five regional rankings for the 2012 NCAA Division III season on Tuesday. New to the No. 1 ranks this week is the women’s team is MIT in the New England region and Trinity (Texas) in the South/Southeast region. Top regional men’s teams include SUNY Geneseo (Atlantic), Central (Iowa) (Central), Calvin (Great Lakes), Haverford (Mideast), North Central (Ill.) (Midwest), Bates (New England), Emory (South/Southeast), and Claremont-Mudd-Scripps (West). No. 1-ranked women’s teams are St. Lawrence (Atlantic), Wartburg (Central), Calvin (Great Lakes), Johns Hopkins (Mideast), Washington (Mo.) (Midwest), MIT (New England), Trinity (Texas) (South/Southeast), and Claremont-Mudd-Scripps (West). NCAA Division III Regional Championships will be held on Saturday, November 10. NCAA DIII Regional Championships Central. USTFCCCA Regional Cross Country Rankings are determined subjectively by either a single member coach or by polling the region’s coaches (each region varies).